Some more details about the upcoming 2H2011 Technic sets have surfaced at a German online toy store, namely their descriptions and prices. These help us have a better guess about their potentialities. First, the 8071 Lift Truck. Currently there is no picture at its page, but we already know well what it looks like. It costs 33.33€, which I believe is a quite good price. With the truck and its platform is the limit! Manage it in position, drive from the boom and use the freely moving and rotating arm to position the platform correct. This truck can also open the doors. Can also be converted into a tele-loader. With the service truck and its platform is the limit! The description confirms what was guessed from the available pictures: functionally it's equivalent to the 8289 Fire Truck, but with new construction techniques and opining doors. What is new is the B-model: I suspect the "tele-loader" is a telehandler, perhaps with a size between the 8283 Telehandler and the 8295 Telescopic Handler. 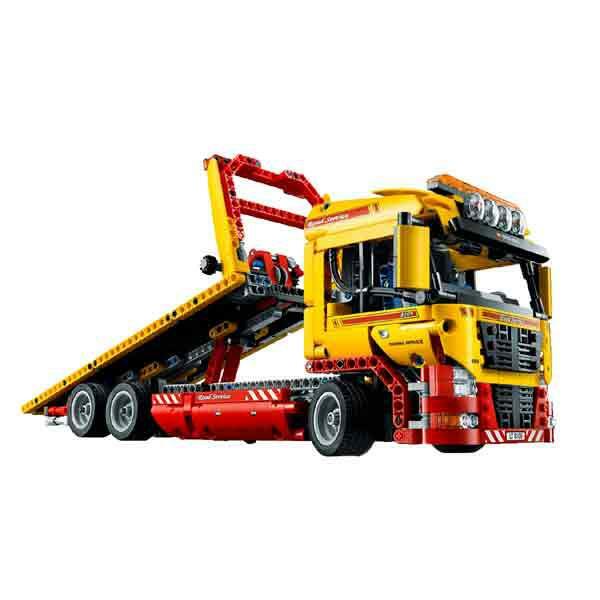 Next is the 8109 Flatbed Truck. It costs 79.99€, maybe a bit high for a set of its size with a single motor and battery box. If a vehicle has to be transported, the trailer is the right choice! Put him in the right position, use the Power Functions to raise the motorized loading area or lower and using the winch to charge a vehicle. Or go from the towing eye to tow another vehicle. Can be transformed into an airport catering truck. With the tough trailer you can really carry it all! This confirms us that it indeed has two motorised functions: tilting the bed (and, from the pictures, most probably sliding it as well), and raising and lowering what I interpret as a wheel lift, similar to the one at the rear of the 8285 Tow Truck. Also, it has a manually-operated winch. I wonder what a Technic airport catering truck would look like and do… unless the translation isn't 100% correct and the B-model is instead an airport fire truck like the 8454 Rescue Truck (but the wheels and tyres are too small to look good in such a vehicle, in my opinion). Last but definitely not least, the 2011 flagship, the 8110 Unimog U400. According to its page, the 'Mog will cost 155.54 €, which, comparing with the 8053 Mobile Crane also there for sale, should cost (excluding early-adopter inflation) almost 195€. Even excluding the increase due to licensing by Mercedes-Benz, there is no doubt that this will be a real wallet-bursting behemoth! This versatile Mercedes-Benz Unimog U400 you are up for any challenge! He is not only the largest Technic model - but also the first that combines pneumatic power functions and in a model. It is equipped with a pneumatically powered, fully steerable, almost 360 degree rotating crane with gripper arm and a front winch - all driven by power functions. The unique design also features a fully functional control system, a highly detailed engine with moving pistons, a new gear box for high ground clearance and four-wheel-drive and suspension for extreme off-road ability. Crane and winch can be converted into a giant snow plow. With the combination of power and pneumatic functions you master the Unimog U400 every challenge! Pneumatically powered, fully portable crane with gripper arm - driven by power functions. Besides the tasty details we already could guess from the few photos available (one showing the bottom of the model would have been much appreciated), there are some news. First, the confirmation that the model has four wheel drive and suspension, and a piston engine. Fans were already practically sure those would be present, since the opposite would be unthinkable on such a huge model, but it's always good to have the confirmation. Judging from the image, I'd say that, unfortunately, all the kibble between the front wheels makes portal axles unlikely. Yet, all speculations are valid until the real thing starts falling into the hands of avid fans! The already foreseen modular attachments to build different models, sounds really cool and real for this kind of model. "Statt 189,98 € (Unser regulärer Preis.)" indeed the images are still very unclear. But I still a possibility for the elevated portal axle, in the latest image. Conchas, what is the latest picture of Unimog you are refering to? And from where it is possible to see? The one in this post! "According to its page, the 'Mog will cost 155.54 €, which, comparing with the 8053 Mobile Crane also there for sale, should cost (excluding early-adopter inflation) almost 195€." Why compare it with 8053? It's kind of hard to tell how many parts the flatbed truck will have. Given that most sets in that price range have had about 1100 parts in the last few years... I guess it will have about 900 or something (with the motor). The Unimog is looking really good. Quite intrigued by these apparent new parts - but I have no idea what they might be. Just a note on the flatbed B model, there are actual airport catering trucks. It looks like a standard box truck, but with a type of scissor lift that lifts the box up so food items may be loaded and unloaded at a parallel level to the airplane door. Yup, seems i'm gonna be buying more than one Unimog! Already decided! I think Alexandre made a comparation from the Unimog discounted price, with other set discounted and undiscounted prices. Which in fact should not be needed, as the same page also lists the undiscounted price for the Unimog, 189,98€! At least two. One to part-out and another to keep built. In my opinion the airport catering truck should be this. I saw them many times in action. Almost every real-world airport catering truck is white. Maybe some are blue. But due to the panels in the flatbed this probably has a black container. Seriously? Anybody got an idea how many parts the 8110 mog will have? @Wiseman_2: I wanted to compare the 8110 to the 8043 Excavator, since it is the most recent flagship set. However, Colludo.de doesn't have it for sale... Supposedly, the proportion between Colludo/S@H would be the same for the 8053 and the 8110. I didn't notice the page also had the undiscounted price! @onlnguitar: Ah, that makes a lot more sense. I imagine it will have similar functions to this single-set MOC based on the 8052 Container Truck, but with lots more panels. Speaking of which, am I the only one thinking the Flatbed Truck's wheels are too small for its scale? I think the truck's wheels fit fine for its scale. The next size up would have been too large. I think it's more down to the truck's length that gives the impression of undersized wheels. I think I will probably end up buying one of each of these, they all look quite good in their own way... I'll probably pass on the extreme cruiser, it sounds like something built for speed-type functions rather than more interesting ones like the Mog. Also, I wish TLG would make some sort of official announcement for upcoming Technic sets like they do with those in other themes. They give decent images and a full description some time before the set's actually released... I know we'd still be waiting 'till May for that, but given that we know what they are anyway, they might as well try and build up some anticipation amongst those who don't know it's coming. I fully agree with your last statement and have transmitted it on the LEGO Ambassador forum. I wouldn't be very surprised if the 'Mog received an official announcement, given its size, special features (abundance of orange parts, first model with integrated compressor since the 8868), and being a licensed product. On the other hand, TLG might take advantage of the fact that they miraculously have managed to keep the Extreme Cruiser away from our mind-someone-else's-business eyes to make an announcement of it. A making-of video, like the one for the 8275 would bring much rejoicing to the masses! Here is google translate-With this sturdy car to get everywhere. Give to the toughest terrain and try the realistic four-wheel suspension, which handles all inequalities. Open the hood and check the moving pistons. The car has opening doors and trunk. It can be converted to a modified offroad car. 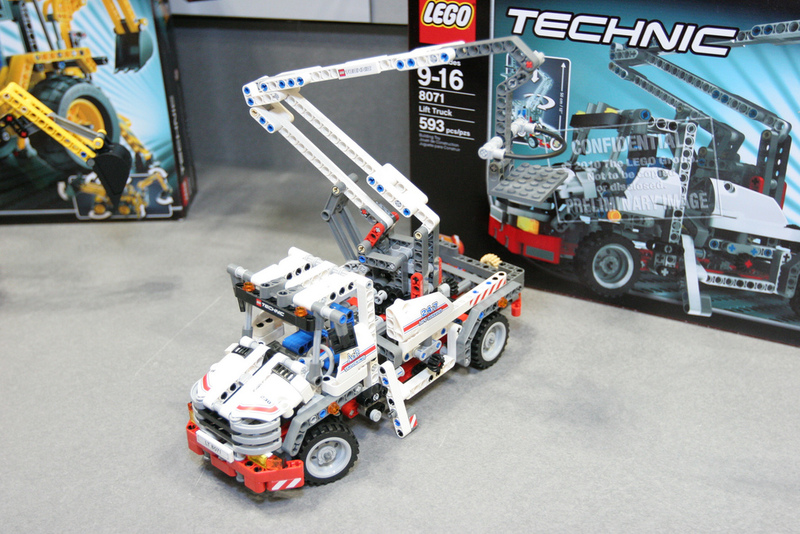 I won't be surprised if the Technic team is experimenting different ways to promote and provide information about new sets towards the dealers, in order to test which one reveals most effective in preventing leaks. By the description, I'd say it is just like 8297 Offroader, but without motorisation. It would be nice, though, if it came with the 'Mog's new "New transmission block for additional ground clearance", with a lower price. According to Brickset, the Mog will have 2049 parts. I am a little skeptical as there is no source, but if it were true, it would be awesome; and it is not entirely unfeasable. If it was the case, it would suggest the Supercar as an "alternative flagship" for those who consider the Mog as too expensive. And think about it. I cannot recall a flagship that included such a range of functions including full suspension and 4WD. "And think about it. I cannot recall a flagship that included such a range of functions including full suspension and 4WD." (four wheel steering), also was a "flagship" of its time back in 1994.
is the most extreme flagships of all times up to date. The Unimog 400 is really a MUST have, either as a collectable or for the parts and the technique. 8880 had 4WD and suspension, yes, but it didn't ALSO have an extensive pneumatic system and motor. I´m with you all the way. packed with goodies when it comes to both functions and parts. If not included (probably not), the first MOD to the Unimog, will be the addition of an air tank, which I believe will improve the playability, a lot. "If not included (probably not), the first MOD to the Unimog, will be the addition of an air tank, which I believe will improve the playability, a lot." Yes, for us - the lucky ones who own an air tank. I´ve heard that they are sold for very high prices at online auctions in Sweden (Tradera or/and Blocket). I doubt it will work better with an air tank. Air tanks need a good airflow control too. And where will you put such a large part without disturbing the looks of the Unimog? Assuming the Unimog works with a motorized pump, as it looks, an air tank would help to have a continuous and smooth play experience. You might have an air overdose using an airtank, wich causes non fluid movements. A compressor gives a steady amount of air; hence more fluid movements. That's why I mentioned an airflow control. And that will be a good challenge, isn't it? With lower rpm motors and small pumps in use (doubt 8110 uses the larger pump or multiple smaller ones), operation of large cylinders tends to be a bit slow. Nevertheless air flow control is a very interesting topic. I remember to have seen a few experiments around. 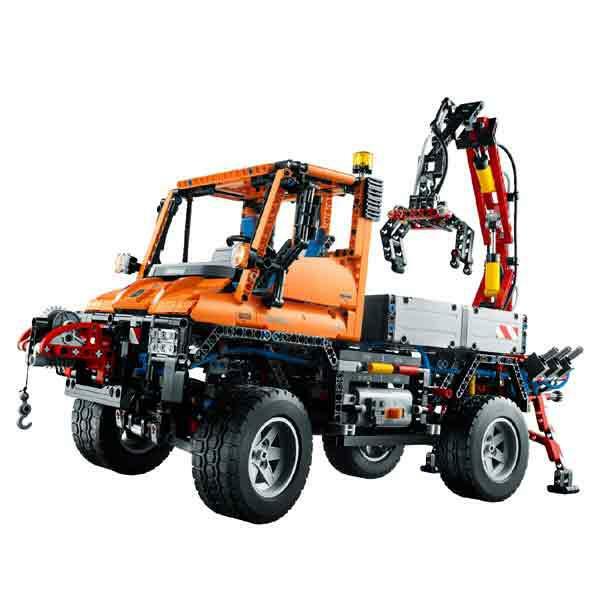 There was a comment at brickset.com saying that the Unimog had 2049 pieces, which, as Wiseman_2 suggests, is not entirely out of the question. In picture 5 at http://technicbricks.blogspot.com/2011/02/2h11-lego-technic-unimog-shows-up-at.html, you can clearly see a straight 4 piston engine between the seats. So yes, we did know that 8110 has an engine.